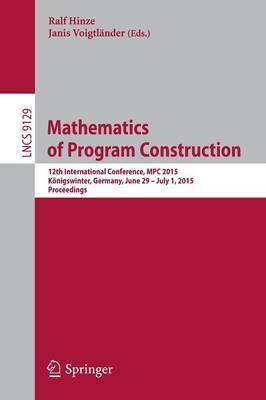 This book constitutes the refereed proceedings of the 12th International Conference on Mathematics of Program Construction, MPC 2015, held in Koenigswinter, Germany, in June/July 2015. The 15 revised full papers presented together with two invited talks were carefully reviewed and selected from 20 submissions. The papers are about mathematical methods and tools put to use in program construction. They range from algorithmics to support for program construction in programming languages and systems. Some typical areas are type systems, program analysis and transformation, programming-language semantics, security, and program logics.